The Company of Watermen and Lightermen’s primary role is the provision and facilitation of training to work on the tidal River Thames. Apprentices and Trainees are bound in January and June each year to serve between 2 and 6 years training depending upon experience. 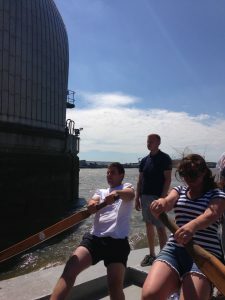 These individuals can come to the Company from a variety of backgrounds from those from the local area generally interested in a career on the Thames, experienced inland waterways Masters form other rivers to sons, daughters and grandchildren of those currently working on the tideway. During training apprentices and trainees work towards a UK Tier 1 Level 2 Boatmasters Licence and specialist endorsements. Training culminates with an examination for Waterman and Lightermans Certificates and gaining of the ‘Freedom’. Some apprentices and trainees use these river qualifications to proceed on to Maritime careers beyond UK waters whilst others go on to start businesses based on the Thames. 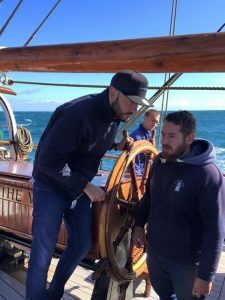 The Company provides continued professional development opportunities and the chance to participate in gaining traditional skills such as sailing and barge driving. The Company has a Training Officer (Alex Hickman) who is accessible throughout the individuals training period and holds training surgeries approximately once per month to give employment and career advice as well as arrange formal safety and Boatmaster’s Licence training. We are able to arrange job swaps and work placements to address experience shortfalls in any individual’s experience profile. If you are interested in becoming a Thames Waterman and Lighterman please contact Watermans Hall on admin@watermenshall.org or call 0207 283 2373. Alternatively, contact our training officer Alex Hickman on alexhickman52@aol.com or call 07956 341482.